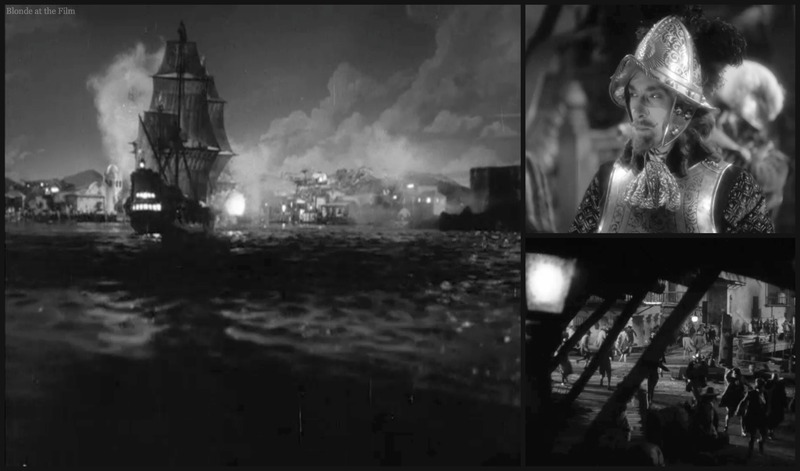 Warner Brothers’ Studio thought that a big, swashbuckling pirate movie would be just the thing after other studios found success with Treasure Island (1934) and The Count of Monte Cristo (1934). So producer Hal Wallis assigned Michael Curtiz to direct a re-make of the studio’s 1924 silent film Captain Blood, which was in turn based on Rafael Sabatini’s 1922 novel of the same name. (The Black Swan (1942) was also based on a Sabatini novel). 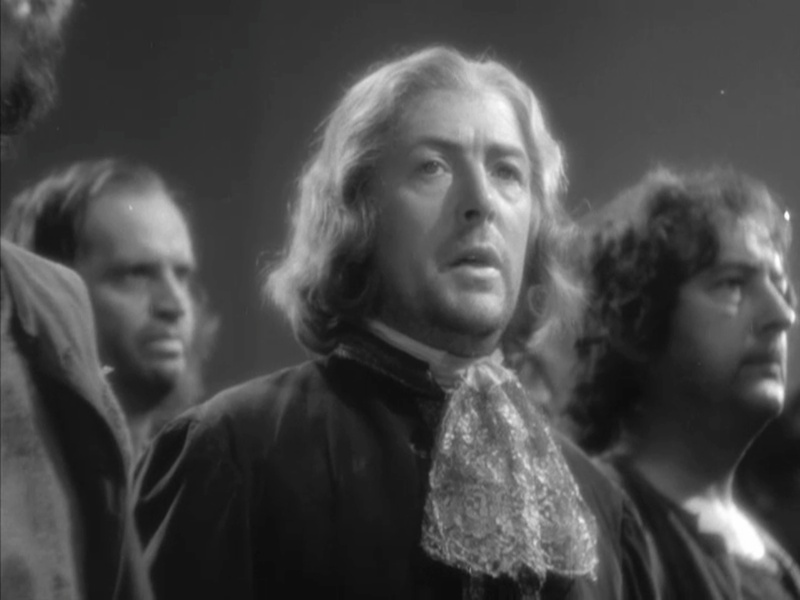 WB budgeted this giant movie at a whopping one million dollars and offered the titular role to Robert Donat, who had starred in The Count of Monte Cristo. But Donat turned it down, afraid that the energetic action sequences would be too much for him. 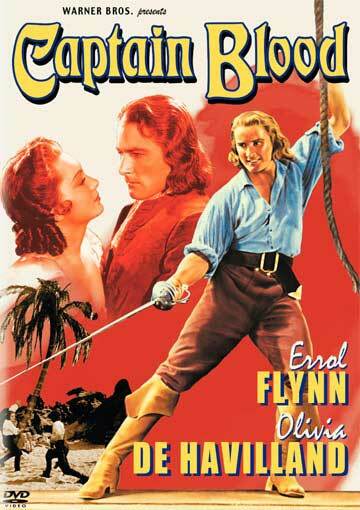 WB searched for another star and decided to go with twenty-five-year-old Australian newcomer Errol Flynn. For the female star, WB picked another relative unknown, Olivia de Havilland. She was only 19, and this would be her fourth film role. 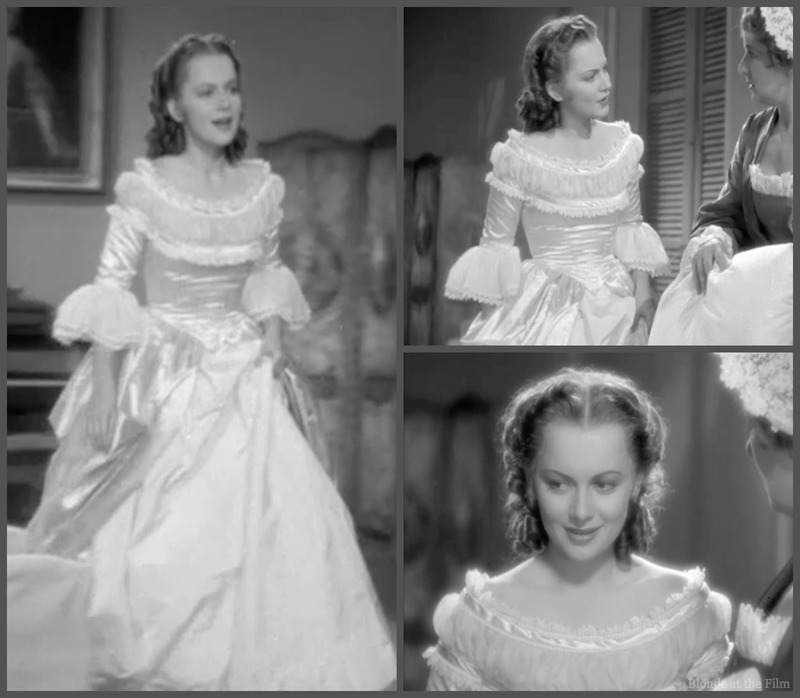 Many know de Havilland best as Melanie in Gone with the Wind, but that role was four years away when she made this movie. You might also know de Havilland as the sister of Joan Fontaine. Fun fact: they used different last names their entire careers, apparently because when Joan decided to follow Olivia into acting, they decided that two “de Havillands” was one too many. Joan took her stepfather’s last name, instead. Fun fact: Fontaine and de Havilland, who were only fifteen months apart, are the only two siblings to have ever won the Best Acting Academy Awards, and they also sustained a legendary sibling rivalry and feud. Anyway, this was Flynn’s first starring role, and audiences loved his ridiculously handsome (despite a silly hairstyle), athletic, charming performance. They also loved seeing him with de Havilland; the two stars would go on to make eight films together, including playing Robin Hood and Maid Marian in 1938’s epic The Adventures of Robin Hood. 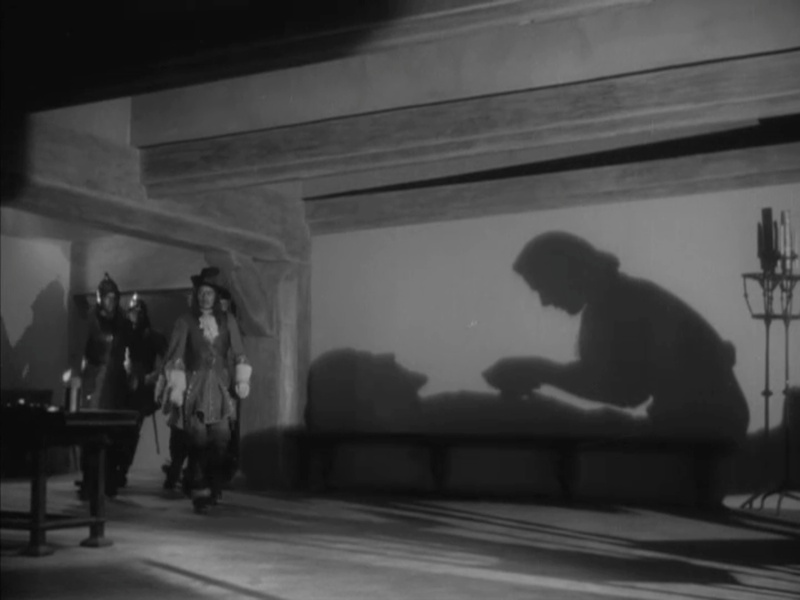 Fun fact: that later film would also reunite them with Basil Rathbone, who had a breakout performance as a rascally French pirate in Captain Blood. Here are our two stars on set. 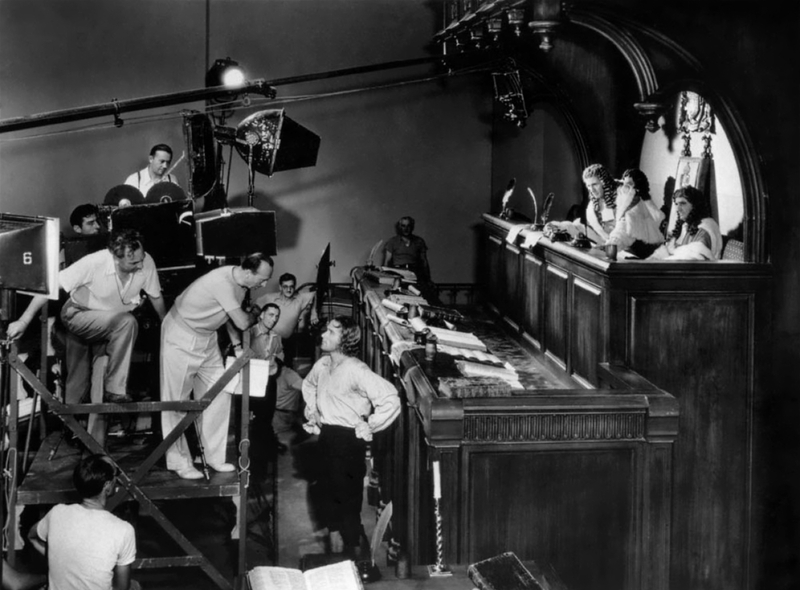 Although de Havilland and Flynn are the more famous duo, their eight films are nothing compared to Flynn and director Michael Curtiz’s record; they worked together twelve times despite disliking each other. Our film begins in England in 1685. We know this because of a handy explanatory title that pops us right into a succession crisis. Catholic King James II was on the throne, but he faced a challenge from the Protestant Duke of Monmouth, who was James’ illegitimate half-brother. Many English people wanted Monmouth, and the Duke led a rebellion that threatened to topple James. That’s where we come in. One of Monmouth’s supporters rides hard through the night as cannon shells explode and Erich Wolfgang Korngold‘s sumptuous score hurries him on. Korngold was an Austro-Hungarian late Romantic composer who was something of a prodigy. He became famous as an opera and concert composer in Europe in the teens and 1920s, when he himself was only in his teens and early 20s! Fun fact: Korngold first came to Hollywood in 1934 to adapt Mendelssohn’s score of A Midsummer Night’s Dream for the 1934 film, which, incidentally, was one of de Havilland’s first movies! Korngold was one of the pioneers of film scores; his scores may not sound so unusual to us because his style became the norm, but they were novel for their time. Plus, it was quite a coup to get a famous composer of Korngold’s stature to write “lowly” film music! He and other extremely talented composers like Franz Waxman and Max Steiner elevated the form with their work in the 1930s. Our wild horseman finally arrives at his destination, the strangely tilted, surrealist residence of Dr. Peter Blood. The man bangs on the door, hollerin’ for the doctor. Inside, we see a spare, minimalist entry with Dr. Blood, his housekeeper, and their oddly powerful candles that are somehow able to light entire walls even behind the person holding them! He relents, though, and opens the door himself. It’s Jeremy Pitts (Ross Alexander), with the dire news that one of Peter’s friends has been wounded in the battle against King James’ forces. He urges Peter to come at once. So off Peter goes to dress with the help of the housekeeper. Gorgeous, crisp shadows and slanting swaths of light and darkness add some striking visuals to this otherwise mundane scene. Peter helpfully talks of his past as he ties his lace cravat. He says he isn’t out there fighting with the rebels because he has had his fill of violence. He fought with the French against the Spanish, and the Spanish against the French, and spent six years in the Dutch navy. After all that, he decided to become a doctor and heal instead of harm. Nice exposition, team. So now we know that Peter Blood is quite capable as a soldier and sailor…I wonder if those skills will come in handy later? (wink.) Peter isn’t sure when he will be back, but he leaves cheerfully after chucking his housekeeper’s chin and calling her his “vinegary virgin,” a name every woman longs to be called…You can watch this opening scene here. To the wounded man’s house, where more striking shadows practically jump off of the walls. As we knew would happen, some of the King’s soldiers arrive and arrest everyone, including Dr. Blood, as rebels. This film was beautifully lit and shot by Hal Mohr. It’s gorgeous; lots of shadows, foregrounding, and interesting angles, never mind the special effects coming later. Often the cinematography is so striking that it takes over the moment, as it does for me in this scene when the King’s soldiers arrive. I don’t really care that Dr. Blood is about to be arrested because I am busy admiring those perfect, deep shadows. But it certainly helps to make this movie look special. 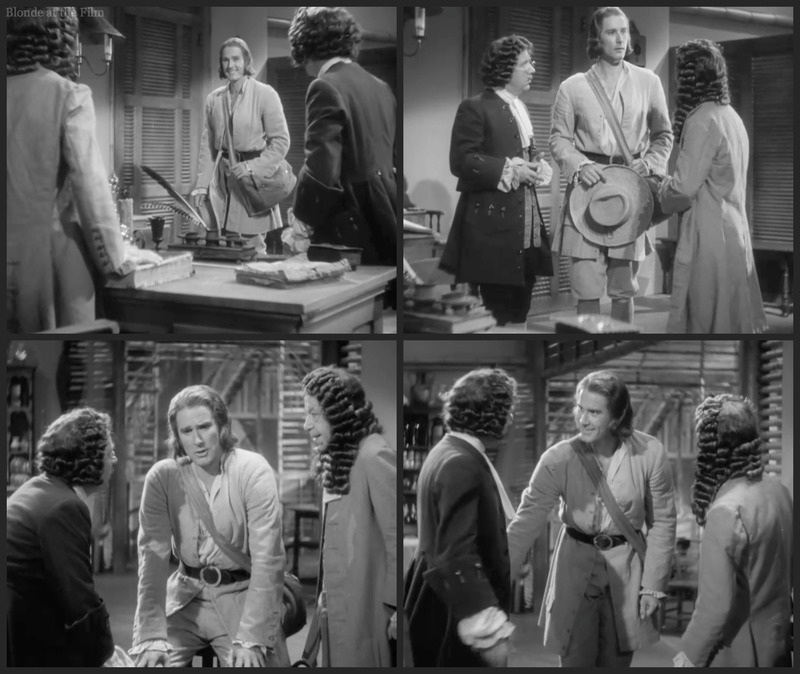 Captain Blood gets to stand trial, though it is a mere formality. Again, notice the shadows from the mullioned windows flung against the wall. But why is the center window the only one to cast a shadow? Movies of this era weren’t obsessed with realism, which is one reason that I love them so much! 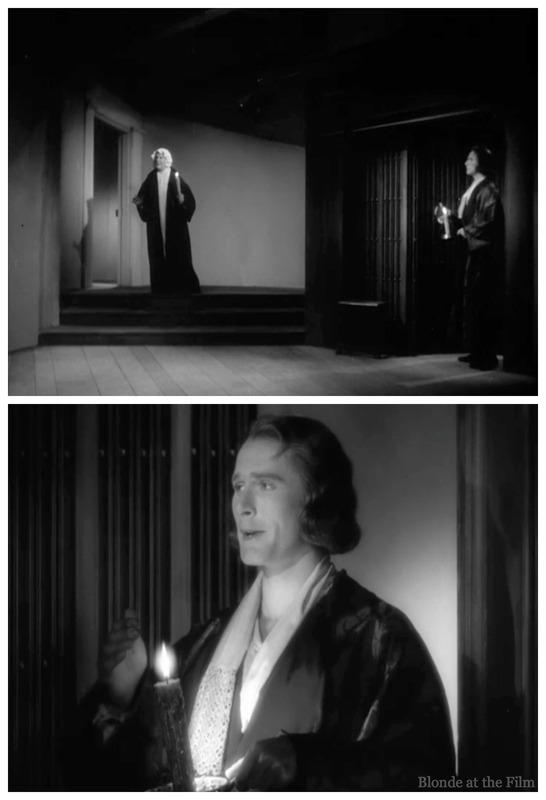 Usually, the filmmakers made the image and the story their priorities; for instance, when it came to filming a scene “lit” by candles as in Peter Blood’s house, they might add extra, not entirely realistic light for the effect, and so we can better see what’s happening, rather than sticking to realistic candle-light. Fun fact: one of Peter’s fellow accused rebels looks just like Monty Python’s Eric Idle, doesn’t he? It’s really a man named Colin Kenny, or maybe Idle is a Time Lord. This scene includes several close-ups, like this one of Kenny’s character, where individual rebels are asked if they are guilty or not. It makes for a ponderous sequence, but we will see all of these men later. Peter argues for his innocence, claiming that he was only fulfilling his doctorly duties to his patient, no matter his politics. The sinister justice cares nothing for Peter’s claims of innocence and sentences him to death along with all of the other rebels. You can watch the trial scene here. Fun fact: as I mentioned earlier, this was Flynn’s big break and he was terribly nervous when production started. As filming went on, he became more confident and his performances improved. 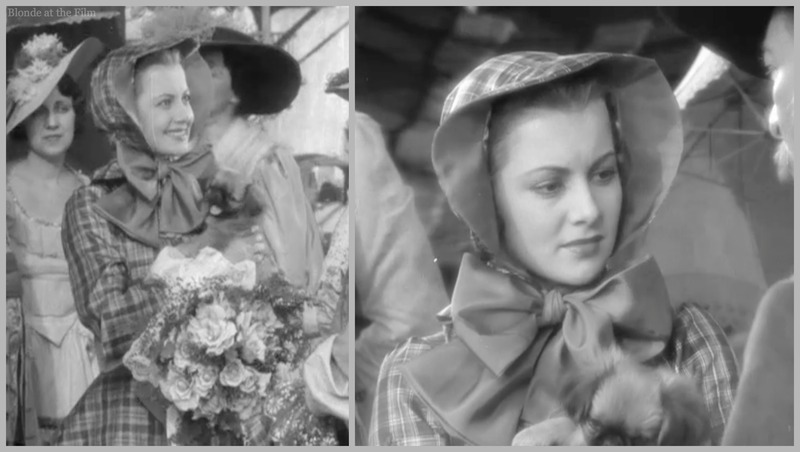 When Curtiz realized how much better Flynn was doing compared to when they started shooting, they actually went back and re-shot some of the earlier footage to capture Flynn’s improved performance. Now that Peter Blood is sentenced to death, it seems our story is over already. But hark! The King needs labor for his colonies in the West Indies, so Peter is “saved” once again, though it means ten years slavery and perpetual banishment from England. The slave auction takes place as soon as the ship docks at Port Royal, Jamaica. 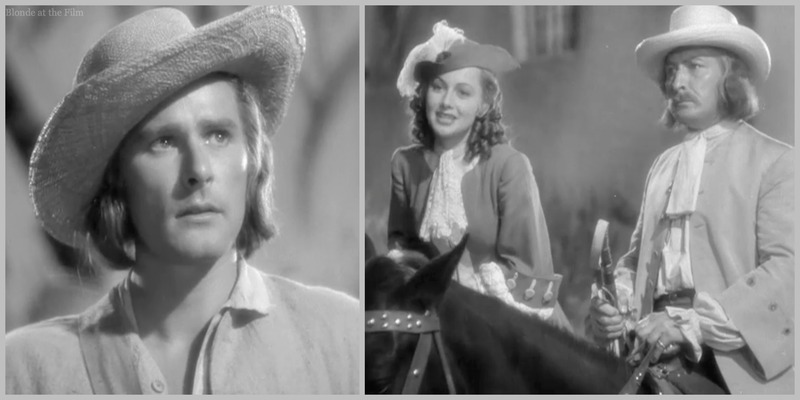 Colonel Bishop (Lionel Atwill) arrives at the auction with Governor Steed (George Hassell, the actor, not the mass murderer), and somewhat inexplicably brings his young niece Arabella Bishop (Olivia de Havilland). 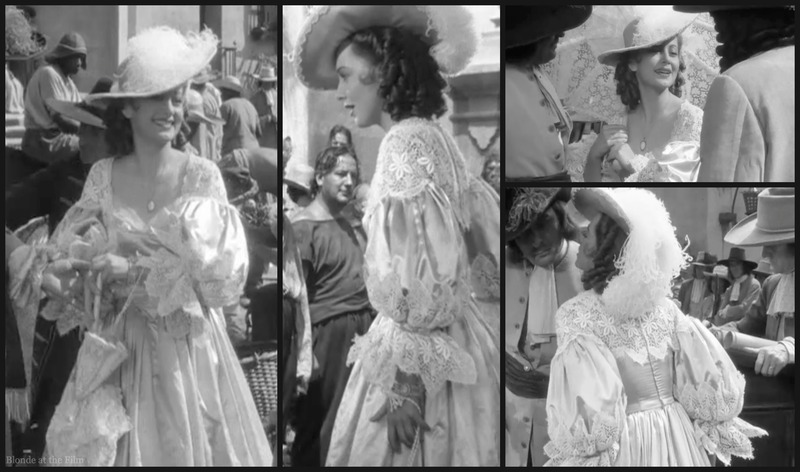 She is even more inexplicably wearing an elaborate white satin and lace dress which magically remains pristine even amongst the filth of the docks. Colonel Bishop owns plantations and gets first pick of the slaves. He examines them as though they were animals, which earns him the immediate hatred of Blood and his fellow slaves. 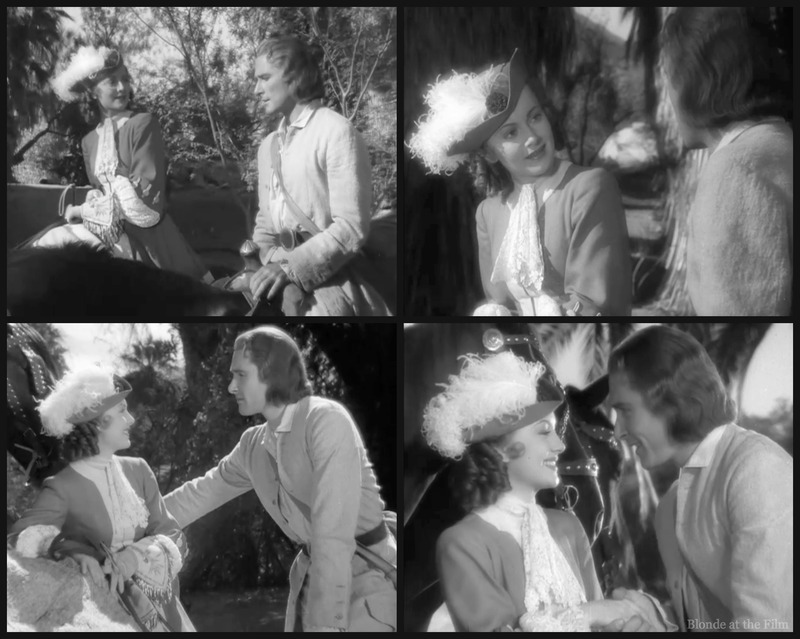 Arabella watches her uncle’s confrontation with Peter, and she is impressed by Peter’s proud bearing and refusal to allow Bishop to treat him like an animal. So when Colonel Bishop refuses to buy Blood, which means he will go to an even crueler master, Arabella intervenes and buys him herself. It seems she has a big heart, but only bestirs herself for young, handsome men. Arabella is surprised when Peter refuses to thank her. She thought she was doing him a great favor, but he just sees her as the spoiled lady who bought him as though he was a hat in a shop window. Her pretty feelings are hurt, so she sends him off to work for her uncle, and it seems they will never see each other again. You can watch the slave auction scene here. 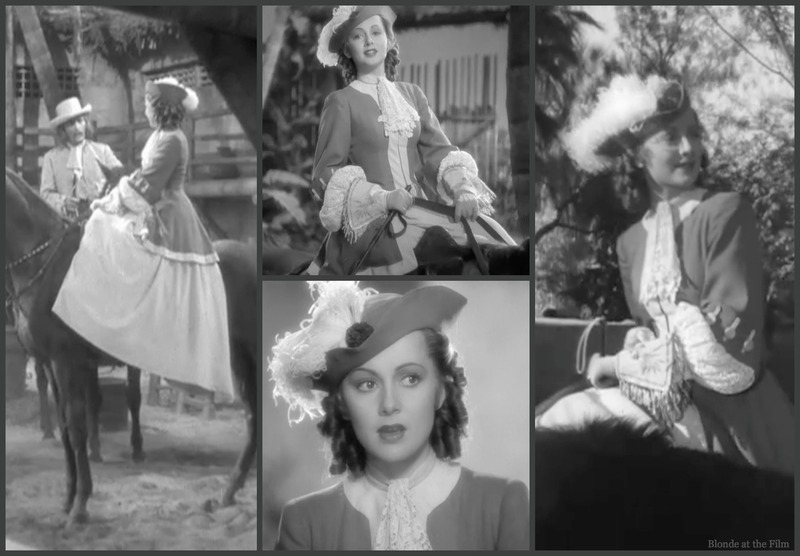 And here is a closer look at her rich gown and feathered hat: exquisite and utterly ridiculous. The costumes were designed by Warner Bros. designer Milo Anderson, though Western Costume’s warehouses provided the basic men’s clothing. It’s fun to watch films like this where the characters prance around in unsuitable clothes and never get dirty. So now Peter Blood must work for a harsh, cruel master. Arabella thought to save him from an even worse fate, but her Uncle’s plantation seems pretty hellish. There are constant whippings, the slaves get branded on their faces if they attempt to escape, and the work is backbreaking and non-stop. Somehow the slaves remain clean and healthy-looking, though their clothes are artfully tattered. Meanwhile, the hypochondriac governor is afflicted with gout, and his foolish physicians don’t seem to be helping. That’s wonderful character actor Donald Meek on the right in the first image. Arabella hears of the Governor’s displeasure with his doctors and has an idea. She hasn’t forgotten about Peter Blood, and since he is the only other doctor on the island, she suggests that the Governor give him a chance. That day she wears another pale gown, this one with ruching and ruffles. I suspect that the same voluminous taffeta-looking skirt was paired with a different top and overskirts for at least one other costume. Anyway, on Arabella’s advice, the Governor summons Dr. Blood to be his personal physician. A few months go by, and the Governor’s gout is almost healed! Even better than that, though, is that Peter’s new position grants him a reprieve from slave labor and allows him to plan an escape. As he leaves the Governor’s residence one day, Peter runs into Arabella. They chat, but he’s still proud and cold, especially because he likes her despite everything. Her low-cut bodice doesn’t help. So he insults her again and she storms into the house. It must be love! Costume appreciation break. Those notched sleeves, bodice, and hem rather remind me of crenelated fortress walls. Anyway, now that Peter has a friend on the outside (Honesty Nuttall), he puts a plan into action. He goes to chat with the Governor’s former doctors, whose business has utterly dried up thanks to Peter. He insinuates that with just a little help, a boat could be purchased and provisioned which would then allow Peter to escape this dratted island. The doctors are so desperate to get rid of their rival that they agree to furnish the necessary money for Peter’s escape. Peter is a smart guy, and skilled at manipulating the foolish. You can watch the scene here. Peter tells his fellow slaves of his plan. Now they are just waiting for Honesty Nuttall to find and purchase a suitable boat. Oh, and they also have to figure out how to escape the well-guarded stockade, but that’s left very vague. In an awfully convenient and amusing scene, each slave turns out to be an experienced sailor or soldier. Apparently everybody spent time in the Navy! So if they ever escape Port Royal, they will be all set on the high seas! But all might be lost, because Arabella catches sight of Peter at the docks talking with Honesty. But rather than telling her uncle, she lies for Peter and says that he was with her. Naughty girl! Peter was determined to hate Arabella, but she keeps helping him! And then they enjoy a romantic horseback ride with plenty of flirting. It’s confusing. But then Peter goes too far and kisses Arabella, who smacks him. Now their enmity is re-established. Whew. You can watch their horseback date here. Somehow Colonel Bishop gets suspicious and flogs Jeremy in an attempt to get information. But Jeremy stays silent. Then Bishop goes after Peter, but a timely interruption saves Peter from a beating. Bishop and his men run to defend the town from the pirates. Seizing their chance, the slaves escape. We don’t see them do it, but somehow they make their way to the harbor. Meanwhile, we get to watch the attack led by a thin-faced and conquistador-helmeted Spaniard. Fun fact: there were no full-sized ships used for the battle scenes in this film. 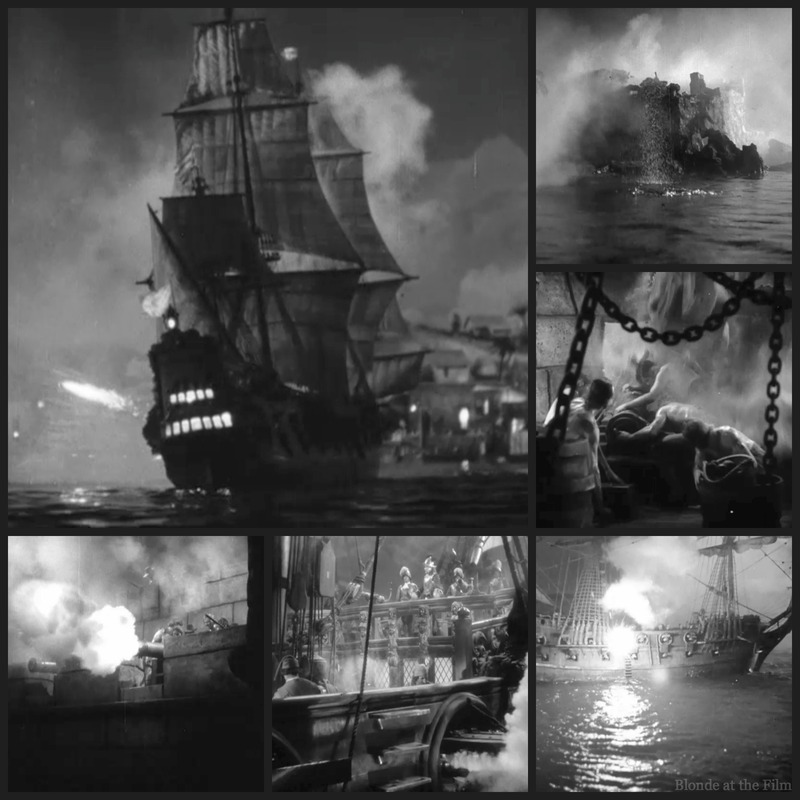 Instead, miniature models, process shots, and footage from an earlier silent film, The Sea Hawk (1924) (also based on a Rafael Sabatini novel) were combined in spectacular fashion. It makes me feel as though I am on the Pirates of the Caribbean ride at Disney! Although tame by today’s standards, we do see townsfolk running for their lives and being crushed by falling buildings, though the huge (fake) stones and beams seem to bounce a little when they land. But it is still an impressive achievement and makes for a chilling attack, all beautifully scored by Korngold. For more great fights at sea, check out The Black Swan! To reflect his source material, Korngold asked for his screen credit to read “Musical Arrangements by” rather than “Music by” or something similar. This disqualified him from the Academy Award for Best Score, even though the vast majority of Captain Blood‘s music was original. The town falls and the Spanish captain (in some beautiful shots with shadows, depth staging, and foregrounded candles galore) demands payment from the Governor in return for not burning down the entire town. Meanwhile, the slaves’ small boat was sunk by the Spanish, so Peter and his gang use one of the Spanish rowboats to reach the pirate ship, where they overwhelm the small crew onboard. Instead of manning a small skiff, now Peter is master of a large, well-equipped pirate ship! It’s taken an hour (just over halfway through the movie!) of Captain Blood before we get a Captain Blood, but now the pirate fun can start! Finally. 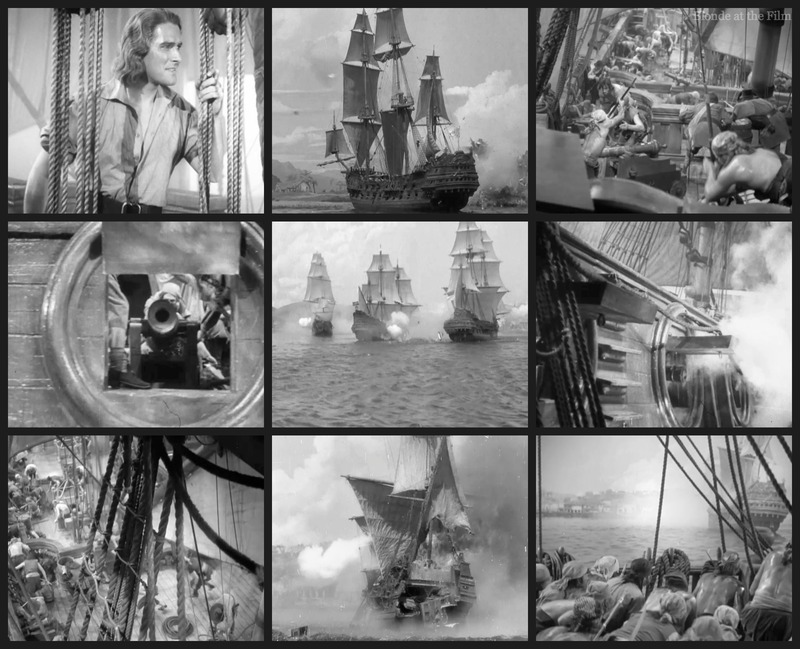 Captain Blood and his crew linger in the harbor until they see the pirates returning to the ship in their rowboats. 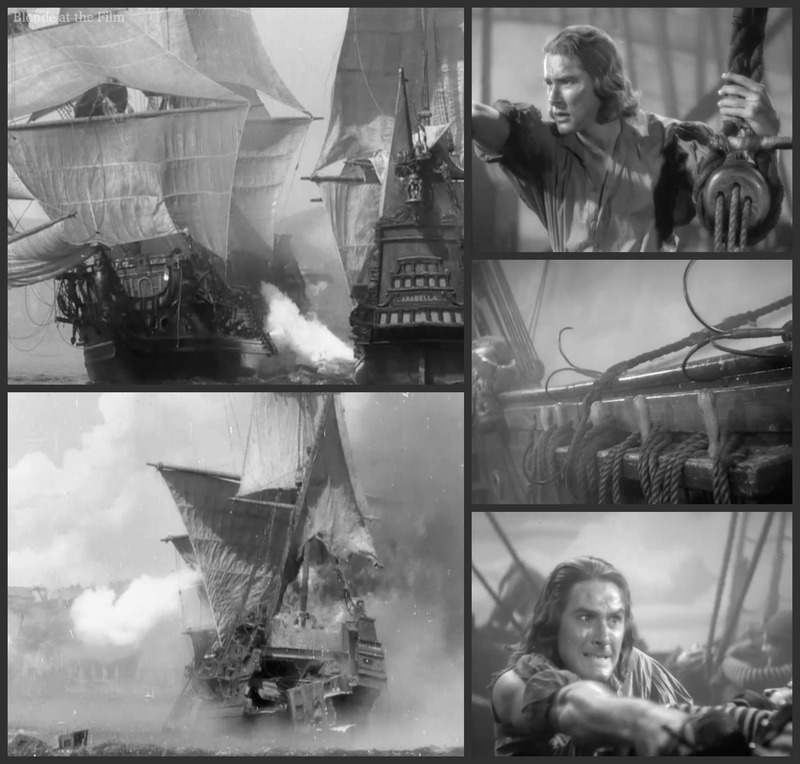 Then Captain Blood’s crew fires on the boats–no more Spanish pirates! Colonel Bishop and Arabella hear of this miraculous turn of events, and Bishop assumes that brave townspeople took the ship. He rows out to thank them, and climbs aboard the magnificent ship set surrounded by a painted backdrop of sky and waves. The backdrop and sometimes the camera move in a rolling motion to simulate a ship’s gentle swaying. It’s a nice, surprisingly effective technique to mimic being onboard ship. Bishop is shocked to see his escaped slaves on board, but he tells them that he is happy to write to the King to ask if their terms of slavery might be slightly shortened in thanks for their great service to Port Royal. The slaves are disdainful of this ungenerous offer, and they are about to hang their hated former master until Captain Blood intervenes and orders them to throw him overboard, instead. 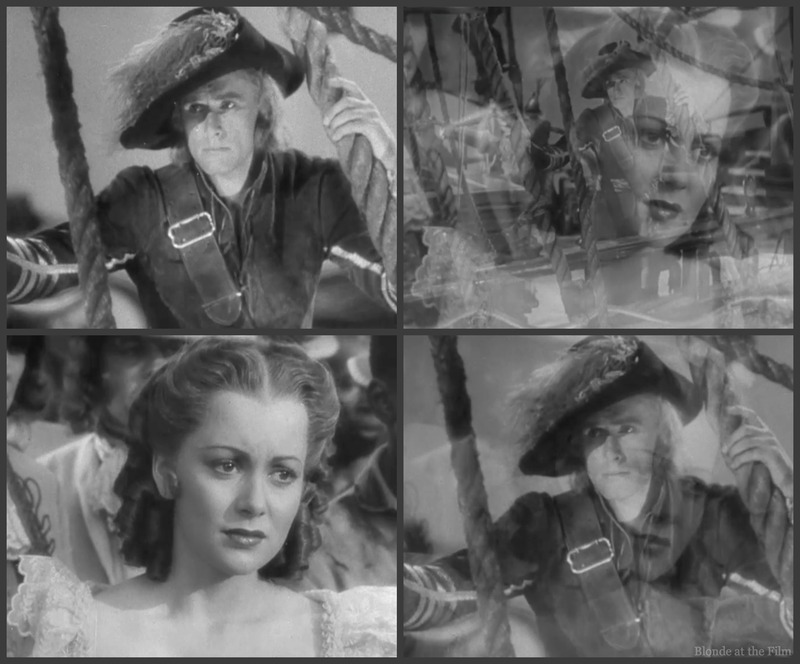 As his men haul anchor to depart, Captain Blood stares at Port Royal and Arabella stares at the ship. They seem to be exchanging wistful looks across an impossible distance. 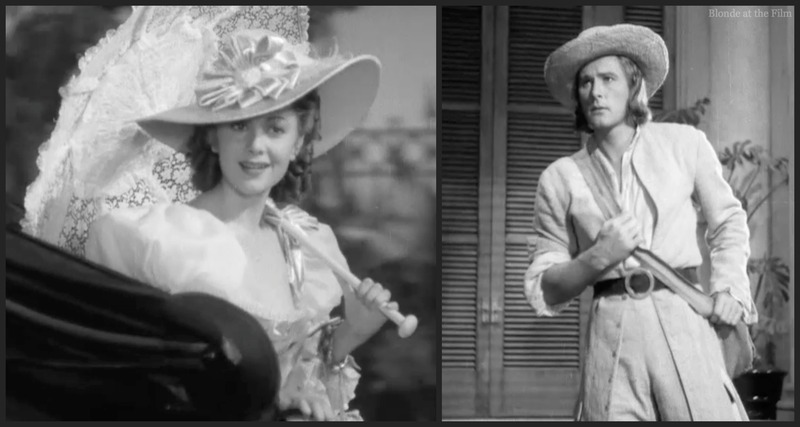 His face fades into hers and then back again as Korngold’s exuberant, trumpet-heavy pirate music segues rather sharply into the surging strings of the love theme. It’s not the first time we’ve heard this love theme; in fact, it plays nearly every time Peter and Arabella are together, or thinking of each other, but this is a very obvious instance. You can watch the scene here. And then off the newly-minted pirates sail into the wild blue! They are very civilized pirates with lengthy articles setting out their terms of compensation, division of booty, and behavior. For example, there is to be no taking of female prisoners, all treasure is to be first combined into a ship’s fund for repairs and provisioning before it is divided amongst the crew, and specific amounts are paid out for amputated limbs in a sort of brutal health insurance policy. Montage time! Captain Blood (and “a brain,” presumably his) soon become the greatest in the Caribbean. It’s fortunate that he is so appropriately named! 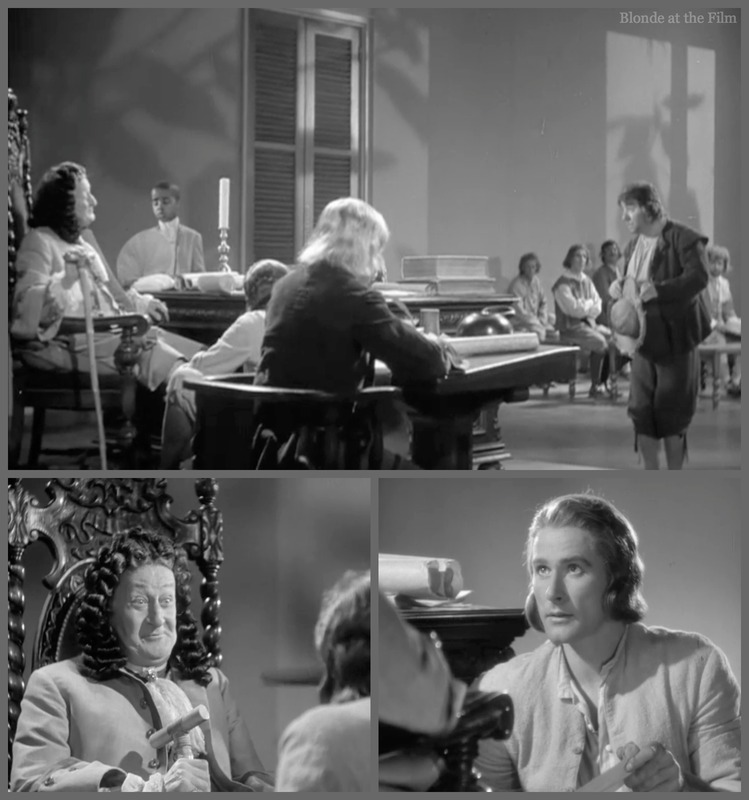 As Captain Blood and his men are taking lives and treasure, the King appoints Colonel Bishop to the position of Governor. 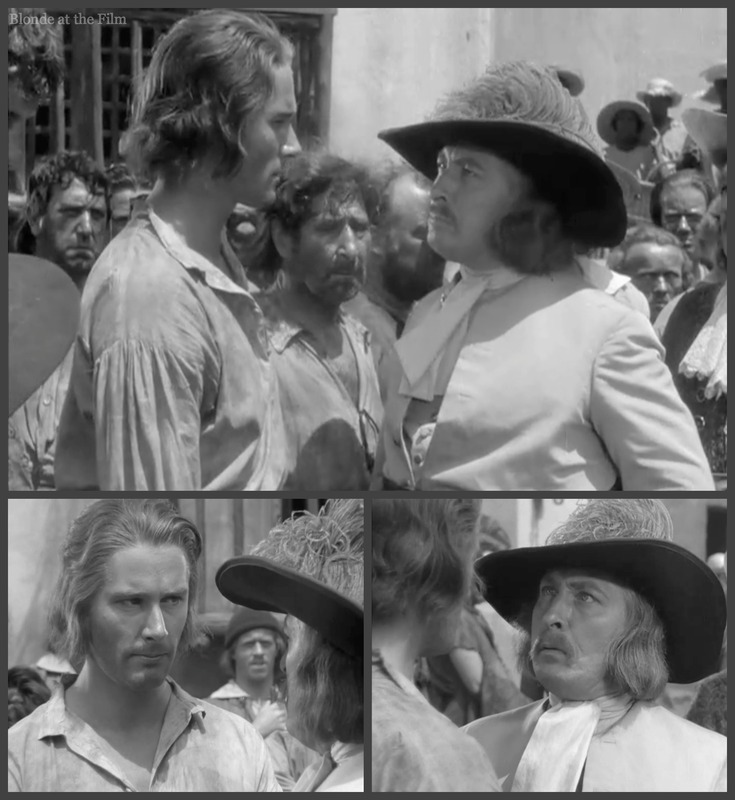 Bishop has become obsessed with Captain Blood, and he promises the King that he can catch him. Meanwhile, Arabella takes a vacation to England, because it was oh-so-common for people to travel across the Atlantic on holiday in the 17th century. She looks cute in her tartan traveling dress with her doggie. Arabella’s ship passes perilously close to Peter’s one evening, and he’s all for attacking it. But his sated crew is anxious to get to Tortuga, and convinces him to let that ship go. Neither Arabella nor Peter know that they are so near to one another, but Korngold does! The love theme plays again, waking Arabella up as Peter gazes at her ship. 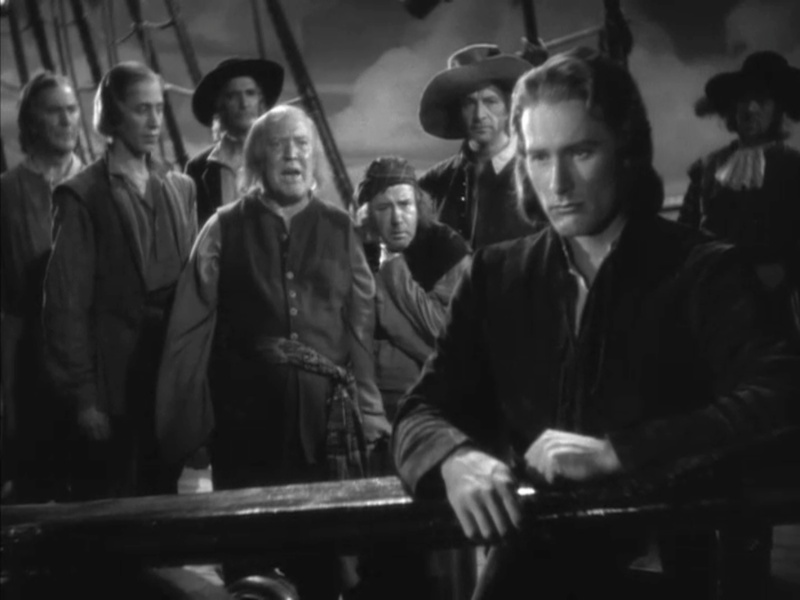 Peter takes his crew to Tortuga where he discusses a partnership with French pirate Captain Levasseur (Basil Rathbone). It is against Peter’s better judgment to join forces with Levasseur, but he’s had quite a bit of rum and he’s feeling chummy. So the two captains sign a partnership, though it’s an uneven one. Both men will sail under Captain Blood’s articles and obey his command. You can watch this Tortuga partnership-papers scene here and get a fun look at Warner Bros. version of a pirate’s den. Immediately upon signing the deal, Peter feels that he has made a mistake. And naturally, he’s right. Remember, he’s got a brain! The pirate captains sail away from Tortuga just as Arabella leaves England for Port Royal. She’s traveling with Lord Willoughby (Henry Stephenson), a special emissary from the King. He’s a kindly, wise fellow. But both he and Arabella smile dumbly as Captain Levasseur’s ship bears down upon them. 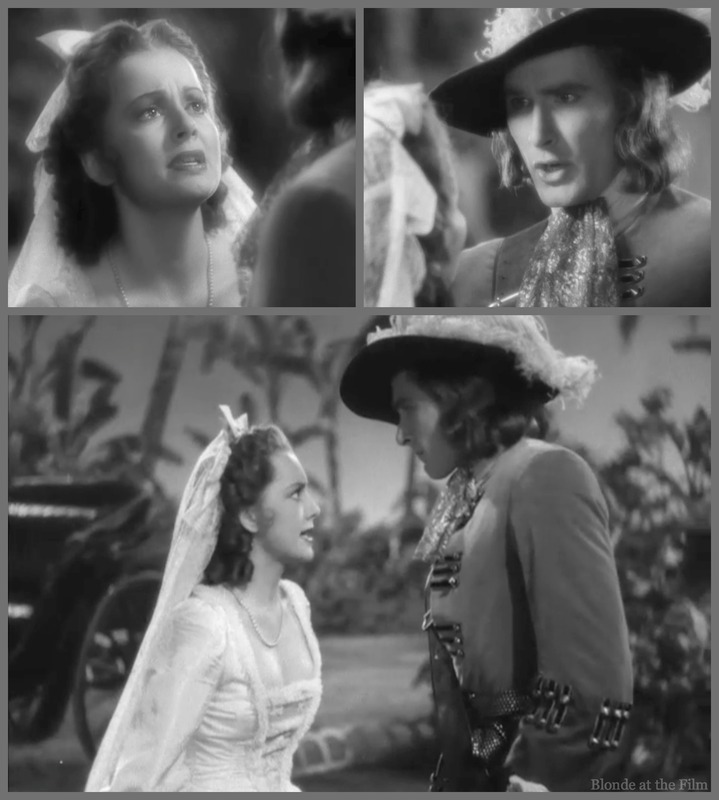 Just as things look bleak for Arabella and Willoughby, Captain Blood arrives looking a bit foppish. He pretends not to recognize Arabella, and instead chastises Levasseur for taking a female prisoner and ransoming her unfairly. Peter’s silver tongue convinces Levasseur’s own men that their captain is in the wrong, so when Peter offers to pay Levasseur’s crew the ransom set for Arabella, they jump at it! How the tables have turned! Now it is Peter buying Arabella! As Arabella and Willoughby are led to Blood’s camp, Levasseur snaps. He rejects Blood’s rational, article-abiding solution and instead challenges him to a duel. It’s a weird turn of events, though, since Levasseur was the one who was eager for a partnership in the first place…he seems pretty unstable. Blood is only too happy to accept Levasseur’s challenge. Hats and coats come off, and swords are brandished! It’s a great fight by two excellent movie swordsmen over beautiful terrain. Fun fact: most of the film was shot on the Warner Bros. sound stages, but this sword fight was filmed at Laguna Beach, CA. 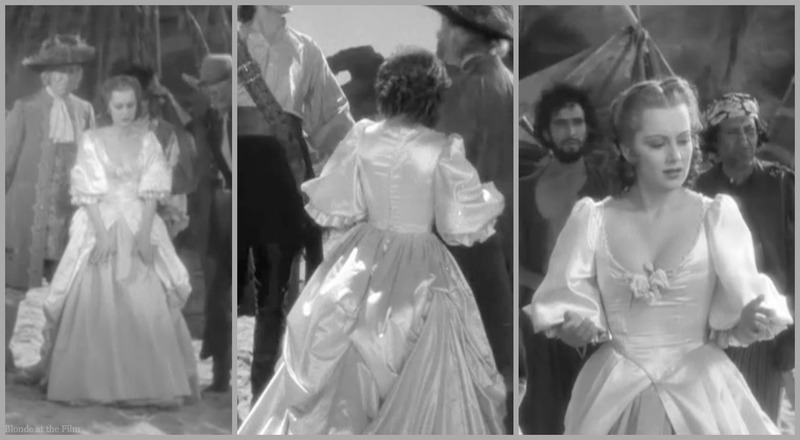 Curtiz, Mohr, and the fight choreographers took full advantage of the gorgeous location. Guess who wins? You can watch the argument and duel here. Fun fact: Rathbone and Flynn would have another, even more epic, sword fight in The Adventures of Robin Hood (1938). 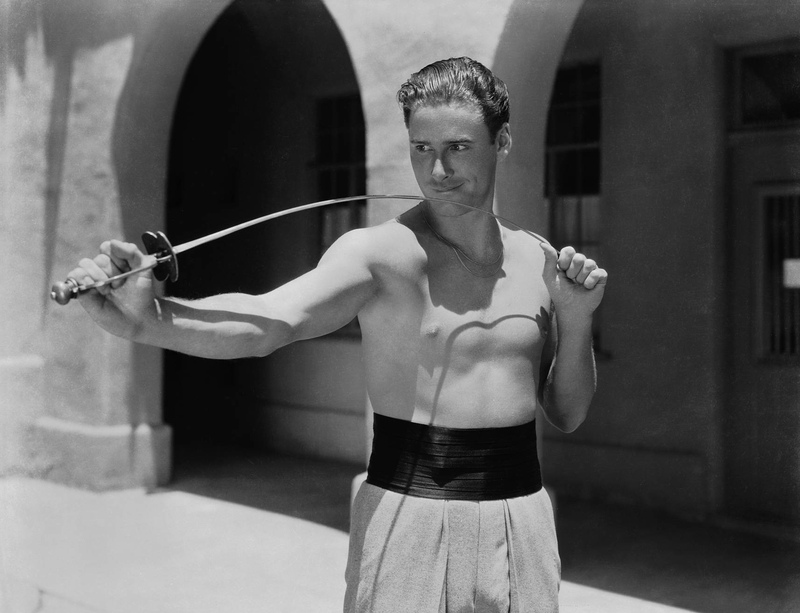 Here is an adorable shirtless Flynn goofing off with his sword. He was athletic and graceful, and seemed utterly at ease as a swashbuckler! Costume appreciation break. 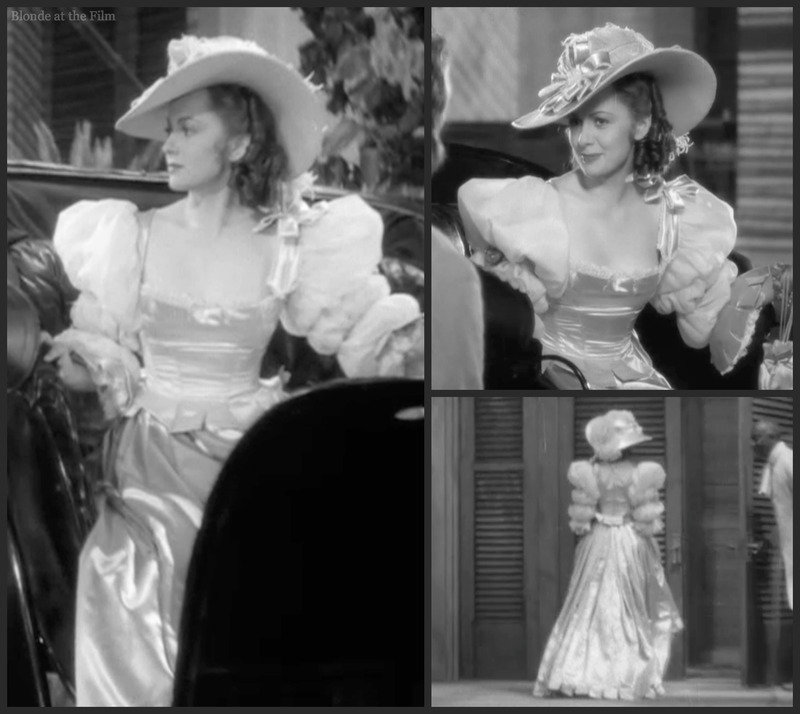 I think that this is one of the costumes that reuses the taffeta skirt by adding a new top and attached overskirt. It’s also really appropriate for 17th century trans-Atlantic travel. Anyway, Captain Blood treats Arabella and Willoughby kindly aboard ship. He even tries to impress Arabella with his ill-gotten but breathtaking treasure. But she is all pissy at being bought (did she want to be left with Levasseur??) and disdains his pearls and rubies. Later we find out that she is just deeply disappointed that the good man she knew has become a nasty, murderous pirate, but Peter’s feelings are rather hurt. He decides to prove to her that he is honorable by taking her back to Port Royal. His crew has a mini-mutiny at this news, as Governor Bishop has an English fleet stationed at Port Royal, and it’s basically suicide for the pirates to be anywhere near the island. So Peter appears to relent but then manipulates his crew into sailing to Port Royal, after all. But more than the fleet awaits them. When Port Royal appears over the horizon, they realize that the town is under attack. Lord Willoughby tells the astonished, uninformed pirates that it’s most likely the French navy, as England is at war with France. Governor Bishop was supposed to be defending the town, but instead he took the fleet out in search of Captain Blood. Tsk, tsk! Turns out, though, that King James has been overthrown and now King William is on the throne! The pirates are happy to accept King William’s pardon and his offer to join the Navy, and they’re anxious to perform their patriotic duty. So they attack the French ships! There is a great deal of cannon fire, skilled ship maneuvering, and hand-to-hand combat with Captain Blood wielding his sword with great effect. Fun fact: this huge, long battle scene used 2,500 extras and an enormous technical crew, and you can see why. There is so much going on in this frenzied battle; ships are blown apart, masts break in half, and men swing from one ship to another shooting and hacking at each other as Korngold’s Liszt-inspired battle theme rages. Eventually the battle ends and Captain Blood, and England, have triumphed! Now to that romantic storyline. Governor Bishop has just arrived back in Port Royal, and Arabella is terrified that her uncle is going to arrest and execute Peter. She begs him to leave or to hide, but he’s got a secret. First, though, he wants to find out how she really feels about him. When she finally admits that she loves him, he shouts this wonderful news to Lord Willoughby, who is enjoying a cocktail on the porch. Then Peter takes Arabella to the Governor’s office where they await her uncle with some big news. Governor Bishop has been demoted after his treasonous act of sailing the fleet away from Port Royal. So who is the new governor? Introducing, Governor Blood! And there will shortly be a new First Lady of Jamaica, too. Arabella is already dressed for a wedding! Fun fact: Sabatini may have based his character of Captain Blood on real-life pirate Henry Morgan, who was appointed Governor of Jamaica in thanks for his efforts against the Spanish. Despite some ridiculous 17th century dialogue, (delivered splendidly by Flynn who does seem born to wear breeches), and the at-times ponderous pacing, this is a delightful movie with a great cast! You can see why de Havilland and Flynn were paired together seven more times. Fun fact: filming on this movie started in August and lasted through the end of October, 1935, and several editors worked like crazy to craft the huge amount of film into the finished movie in time for a premiere just two months later on December 28. 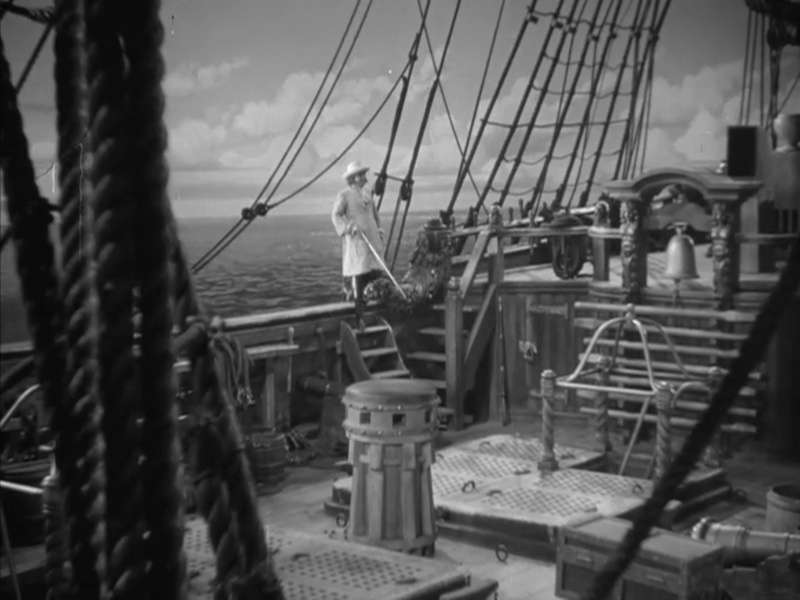 Captain Blood was nominated for Best Picture, Best Director, Best Sound Editing, and Best Screenplay for Casey Robinson‘s script. But it didn’t take home any awards. Mutiny on the Bounty won Best Picture that year; ships were in! Here’s a great review of the movie, and here’s the trailer–enjoy! For more, follow me on Twitter, tumblr, pinterest, Instagram, and Facebook. As always, thanks for reading! And you can buy this great movie here. Tagged as: 1930s, Basil Rathbone, Casey Robinson, Donald Meek, Erich Wolfgang Korngold, Errol Flynn, Forrester Harvey, Hal Mohr, Hal Wallis, Henry Stephenson, J. Carrol Naish, Jessie Ralph, Lionel Atwill, Michael Curtiz, Milo Anderson, Olivia de Havilland, Ross Alexander, Warner Bros.
Well done, as usual, Cameron. I always learn a lot reading your posts. And always enjoy them. 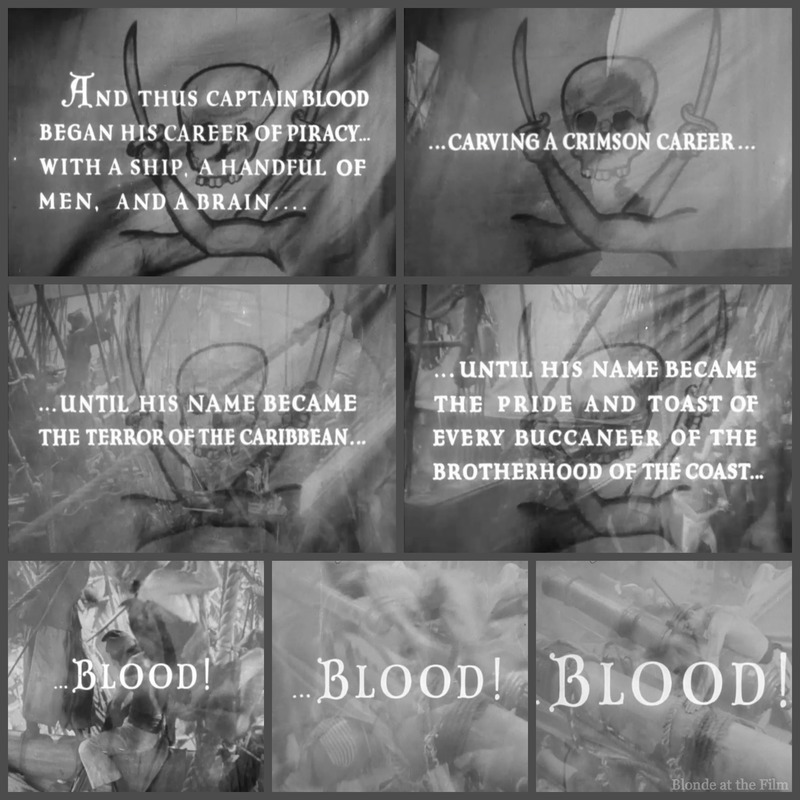 This really makes me want to pay Captain Blood another visit. It’s been a long time. Thank you so much, Martin! I’m so glad you enjoy my posts! I agree–there is something wickedly magnetic about Mr. Flynn! I think they did issue a much shorter version of the movie at some point…Thanks for reading! Thanks for reminding me how much I loved this film. 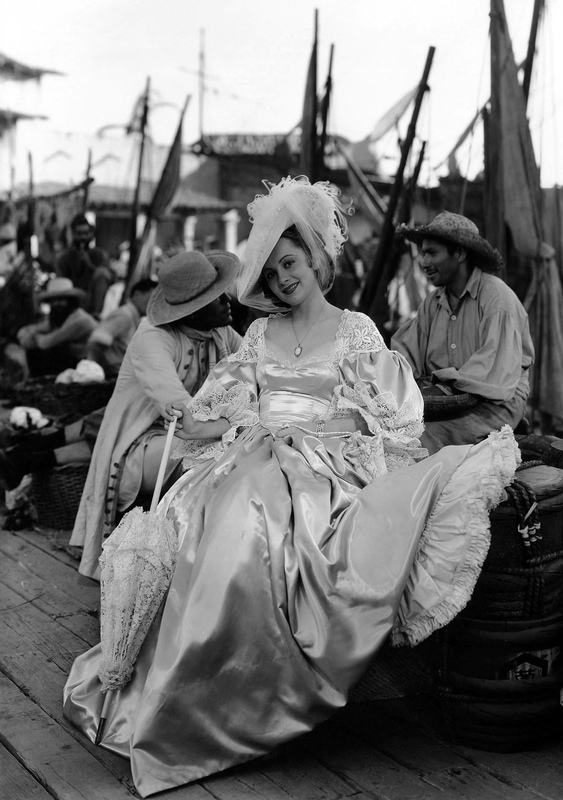 De Havilland looks great, the OTT costumes are just wonderful – I’d love to see them in colour. She always paired so well with Flynn, I also like The Adventures of Robin Hood. Great post! I know, I’d love to see the costumes in color! I bet they were breathtaking! Thanks for stopping by! Or perhaps Eric Idle’s much-older brother! Fun review, Cameron!